The concept for the Inogen One portable oxygen concentrator came to a group of students at the University of California, Santa Barbara’s (UCSB) Center of Entrepreneurship and Engineering Management (CEEM). They imagined a single solution oxygen concentrator for the growing number of patients who need the device but want to maintain their mobility while on oxygen. This "Big Idea" led to the identification of an important and expanding market, and Inogen was born. The students’ next requirement involved a high-powered engineering team that could integrate the myriad of technologies needed in the product, hence, a partnership with LaunchPoint. With a technology development team in place to begin the design work, Inogen secured angel investment, augmented by funding from LaunchPoint. The team then recruited a top CEO from the medical device industry to build the company. Inogen set-up shop at LaunchPoint and collaborated with our systems, electrical, and mechanical engineers as well as outside consultants to design a pre-production prototype. As the design progressed, Inogen successfully fabricated components in the well-equipped LaunchPoint laboratories, located adjacent to their office area. The on-site fabrication capability and priority access enabled schedules that would have otherwise been impossible. The team’s efforts resulted in a pre-production prototype. LaunchPoint’s technical staff collaborated with Inogen on presentations to venture capital firms, assisting Inogen in securing additional funding that enabled the company to move into its own space, expand its sales capability, and present their product at a major medical conference. 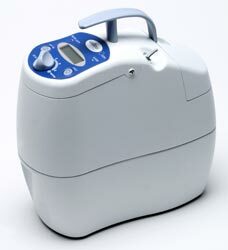 The success of the Inogen One is evidenced in the receipt of a Medical Device Excellence Award (MDEA) at a ceremony in New York City in June 2006. The Inogen One product is now available for purchase. Please visit the Inogen website for more information.